Thank you to everyone who entered the Heath Robinson Caption Competition, organized with Gullivers Bookshop and the Wimborne Literary Festival. 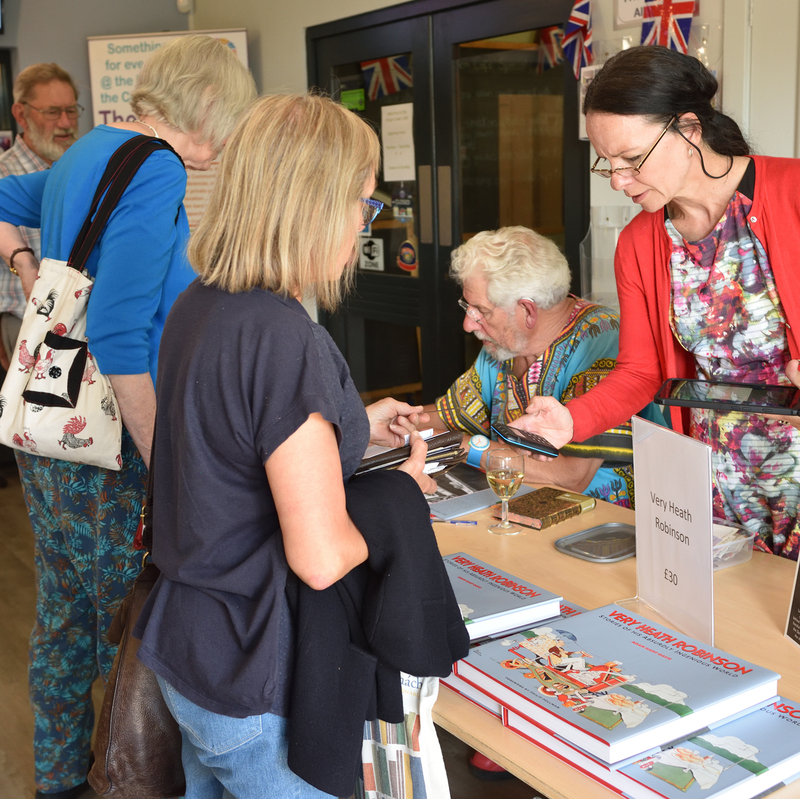 And congratulations to Nerys Hucker who was declared the winner by the panel of judges led by Adam Hart-Davis, seen above signing copies of his Heath Robinson book. The challenge was to caption a family outing on the Weekend All-Weather Tandem. She rose to the occasion. 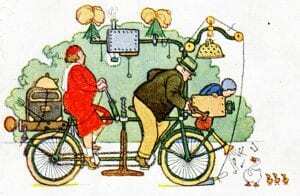 Heath Robinson’s Weekend All-Weather Tandem conveys two adults and a baby in complete safety. ‘I’ve loved Heath Robinson ever since I was a child,’ says Nerys, ‘and I’m sure that studying his wonderful inventions set me on the road to being a patent attorney.’ She wins a copy of the Very Heath Robinson De Luxe Edition, bound in Cherry Red cloth and presented in an engraved birch case secured with knotted string. 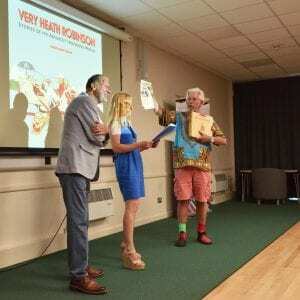 The judges were Adam Hart-Davis, author of Very Heath Robinson, seen holding a copy of the De Luxe Edition in the picture below, Kelly Webb, Mayor of Wimborne, and Malcolm Angel, Director of the Wimborne Literary Festival. Their decision to award the prize to Nerys Hucker was unanimous. They announced the winner during Adam’s talk at the Wimborne Literary Festival on Saturday 19th May. The judges announce their decision.